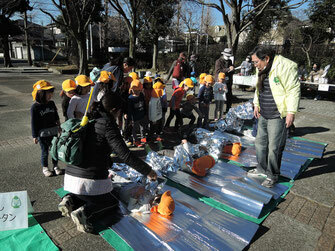 trying out ultra-thin aluminum blankets and also aluminum-coated thin "mattresses", which are used at evacuation centers. Local volunteers in charge of the evacuation center have prepared and carried out this drill. 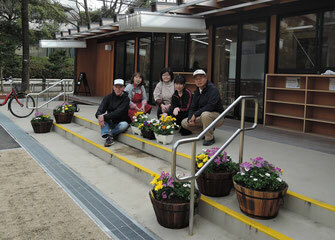 Local volunteers participated in arranging flowers in wooden baskets. This community house was opened in the latter part of 2015, after years of requests by locals to the municipality office. 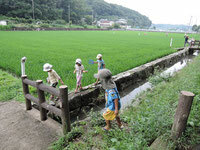 It's now a popular place for local residents who take part in various activities. 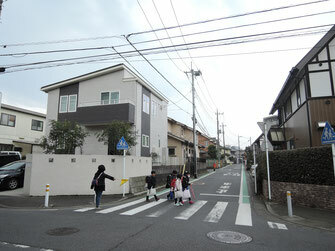 Every morning, regardless of weather, volunteers in our neighborhood look after school children. 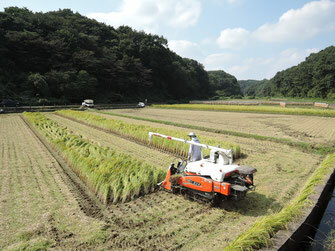 This photo showing a waterwheel in the background was taken in the Jike countryside, northern Yokohama. 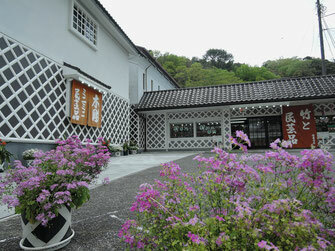 The photo shows a souvenir shop with a traditional exterior located at Shuzen-ji, a well-known hot spring resort, which is around 120 km south west of downtown Tokyo. Izu Peninsula sticks out into the Pacific Ocean and forms a part of the Fuji-Hakone-Izu national park. 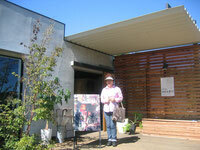 What's golden week? 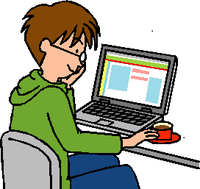 It is so called because there are a number of national holidays from the end of April to the begining of May. 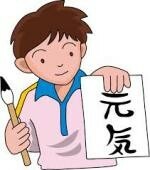 It's like this: April 29 is the birthday of the late Showa Emperor, May 3 happens to be Constitution Day and May 5 is Children's Day. If you were lucky enough, you could have had a nine day-holiday in 2017 including Saturday and Sunday, by taking a few extra days off for yourself. 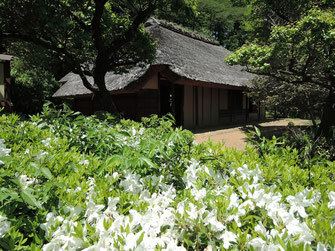 The photo shows an old farm house relocated to there, and white azaleas. 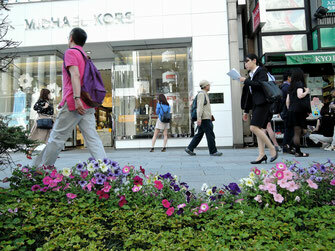 Perhaps Ginza is the most expensive shopping area in downtown Tokyo. Ginza was once under the sea and was reclaimed in the early 17th Century, during the Tokugawa shogunate, as a place for minting silver coins: from which the name of Ginza was derived. 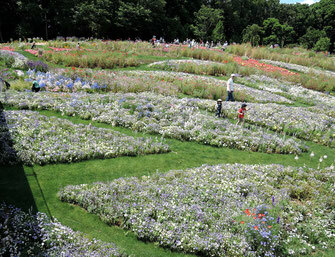 A beautiful garden was made specifically for a flower and greenery festival called "Garden Yokohama 2017". It was closed when the festival ended in June, 2017, but will reopen on a permanent basis next spring. 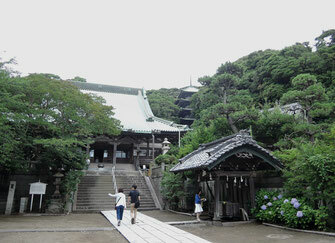 Ryukou-ji is a Buddhist temple in the Enoshima area, a tourist attraction some 40 km south-west of downtown Tokyo. 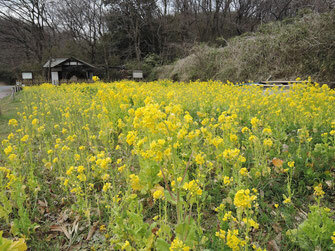 During the Kamakura period (from the late 12th Century to the middle of the 14th Century), the site of the temple was used as an execution ground and it was here that Nichiren, a Buddhist reformer, was to be beheaded because of his vehement criticism of incumbent Buddhist factions that were closely tied to the Kamakura rulers. Luckily, at the last moment, Nichiren's death sentence was commuted to banishment to an island. 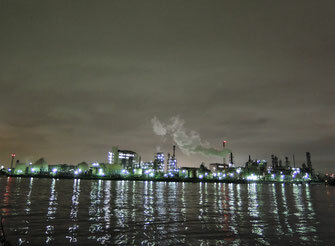 A night boat tour has become a popular tour that appeals to people for its brightly lit factories, an unexpected "beauty." We rode in a boat with no roof capable of taking 40 or so passengers. The tour started from a berth close to Haneda airport, then crossed the Tama River while watching jet airliners making their final approaches. Our boat was small enough to navigate the canals one after another, allowing us to come closer to the big factories. Kamakura, which is located some 50 km south west of downtown Tokyo, was the capital of Japan from the late 12th Century to the middle of the 14th Century. 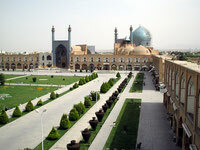 It is a favorite tourist destination because it retains its rich cultural heritage. 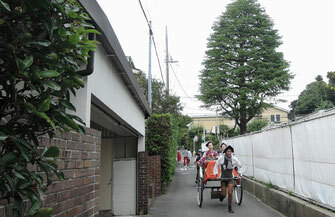 Many visitors go there all year round; famous Buddhist temples and Shinto shrines are always crowded. 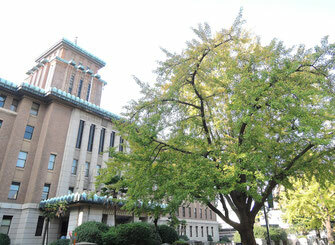 Located in downtown Yokohama, this building was completed in 1928, five years after the 1923 Great Kanto earthquake damaged the previous office. There are numerous footpaths stretching in many directions and connecting parks one after another. 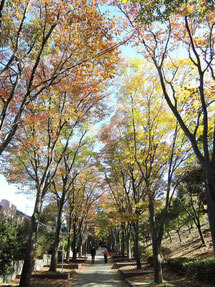 These footpaths are said to be around 15 km in total length. 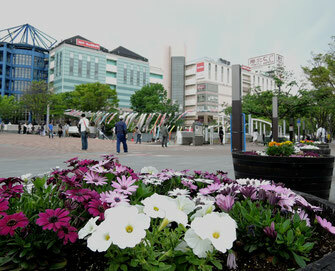 Center Minami is one of the centers in Kohoku New Town. 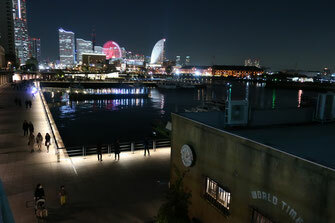 Minato Mirai literally means "a port of the future" and faces the port of Yokohama. 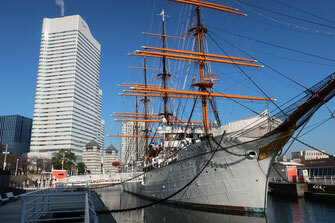 Nippon Maru with a displacement of 2,278 tons was built in 1930 for training sailors. It carried 196 personnel including its crew and trainees. 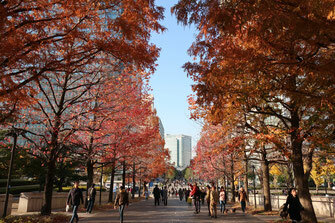 Along this pedestrian street, which runs from Minato Mirai to Yokohama station, a number of big companies have their head offices located. 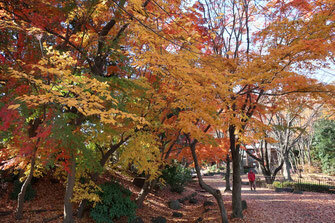 One of the footpaths surrounded by beautiful trees. 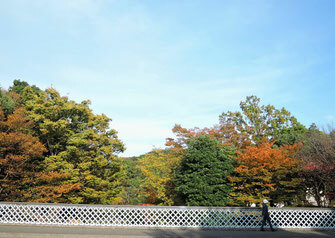 Soon, all those colorful leaves will fall bracing for a cold winter. 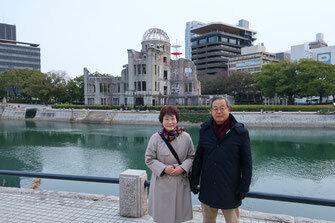 In the background is the atomic bomb dome, a world heritage site. On August 15, 1945 an atomic bomb was dropped and exploded over a hospital, which was about 200 m behind the dome. 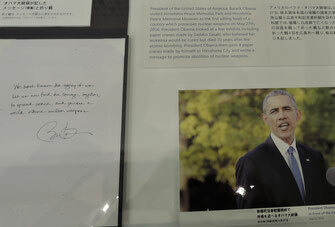 President Barack Obama visited Hiroshima on May 27, 2016 and left this message at the Hiroshima Peace Memorial Museum: "We have known the agony of war. Let us find the courage, together, to spread peace, and pursue a world without nuclear weapons."